Tulsa University Football today is on a trip to Ohio to face the Toledo Rockets, but for much of the first half of last Saturday’s game between the TU Golden Hurricane and the Louisville Ragin’ Cajuns, they traded scores so often most wondered if the winner was going to be whoever had the ball last. 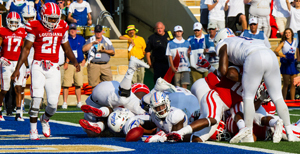 TU struck first when Redford Jones booted a 46-yard field goal, followed by a 38-yard kick by Louisiana’s Stevie Artigue. 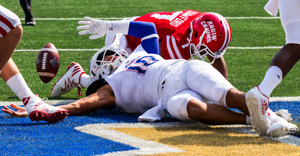 Two minutes later the Golden Hurricane took a 10-3 lead when running back D’Angelo Brewer took a handoff from quarterback Chad President and raced 50 yards for his first touchdown of the day. Brewer was just getting started. Again, Louisiana answered when quarterback Jordan Davis scored on a one-yard run with a minute and a half left in the quarter. 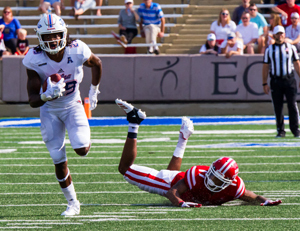 The second quarter was more of the same, matching score for score until TU found the end zone twice in the last 95 seconds of the half. First, President hit Justin Hobbs in stride for a 69 yard touchdown pass. 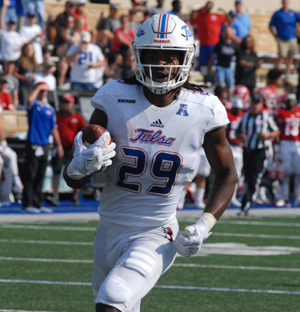 Following a Louisiana turnover, Tulsa’s Corey Taylor scored on a one-yard plunge with just six seconds left and the Golden Hurricane took a 38-23 lead into the halftime locker room. The Ragin’ Cajuns closed the gap in the third quarter, scoring two touchdowns to make the score 38-35, only a failed two-point conversion and a missed extra point kept the game from being knotted at 38 all. Brewer scored his second touchdown of the game, punching it in from one yard out and heading into the final frame TU led 45-35. 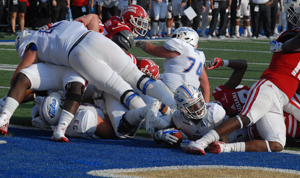 Tulsa pulled away from Louisiana in the fourth quarter on touchdown runs from Shamari Brooks, Brewer and President to put the game out of reach and the game ended with a final score of 66-42. For the game, Brewer rushed for a career-high of 262 yards on 38 carries with three touchdowns. The senior needs 957 yards to become Tulsa’s career leader. President finished the game hitting 14-20 passes for 243 yards and a touchdown and junior wide receiver Justin Hobbs caught five passes for 103 yards to lead the team. TU will return to H.A. Chapman on September 23 to face New Mexico. This entry was posted in Sports on September 16, 2017 by admin.